I’ve been quite lucky. I’ve never sought freelance design gigs. They seem to come my way. But, I only accept them with a few conditions – be flexible, be a partner in the process, and have fun. These are simple conditions, but important ones. Flexibility, because I can’t devote all my time to creative projects. I have a career, a family, and many other things grabbing for my time. Instead, I have to fit it in as I can. I also need a creative partner to bounce ideas around with; to share ideas; and to help deal with the many details of a creative project. Finally, it has to be fun. I love to design. It’s fun creating new experiences and new ways of engaging. The Bla Bla Foods project was all of that and more. A sweet, creative project that we created together while dealing with our busy, daily lives. And, we had a lot of fun. This project came from a referral from a previous client — Sahale Snacks. Previously, I had worked over many years improving their product branding, packaging, overall retail presence. Bla Bla Foods was in a similar state. They had a unique product, but hidden behind poor branding and weak packaging. The creative brief was, well, brief. Modern, minimal, natural, and playful. Oh, and with a sophisticated Nordic vibe. The requirements were extensive — new branding, color palette, iconography, and product packaging. All of this to be created for roll-out at the upcoming Natural Products Expo West show in only four weeks. This is where great partnering comes in. Creating a logo or mark is long and winding road of creating and reflecting. I start with a few general notions informed by research and intuition. 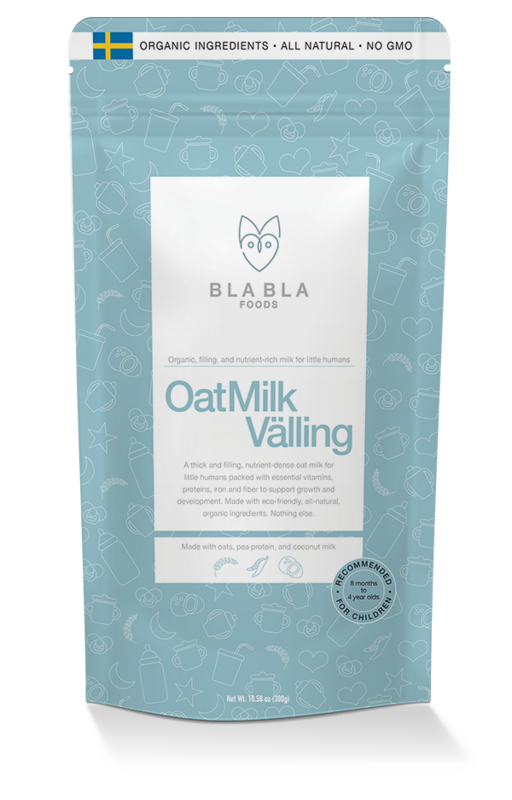 In this case, I started exploring how to graphically depict the key ingredient – oats, while channeling my inner Norseman. At one point, in response to feedback to make it playful and childlike, I surprised myself and the client with a baby sleeping on a leaf. This was quickly discarded. The final mark is a culmination starting from initial explorations of two stylized oat grains arranged to form a heart. This was combined with the suggestion to explore animal depictions, since the original logo was based upon a raccoon face. I initially struggled with this as I didn’t see a connection between animals and the brand. However, as I worked through this idea, an intriguing combination of oat grains, a heart, and face emerged to create a distinctive, memorable logo — the ultimate goals of this creative process. Whenever I start a creative project, I never know how they’ll turn out and what will develop. This is both somewhat frightening and exciting. They also teach me a great deal. I also know that when projects allow for flexibility, creative partnership, and fun great things are created. Please let me know if you have creative project that allow for flexibility, creative partnership, and fun!